There are few things I enjoy more than a juicy, succulent, slightly charred but internally pink cheeseburger. Mix the meat, salt, pepper and worcestershire sauce together. Make a large patty and reserve. Ideally you'd grill these up but I don't have a backyard or balcony so I make do with my stove top and oven. If you're making this indoors, preheat oven to 400 and heat a large skillet with a little bit of canola oil. Once it's nice and hot gently place the burgers down- don't overcrowd. Cook the patty on high heat for about 3 minutes on each side so it gets nice and charred. Only after 3 minutes should you turn the patty over. Meanwhile line a baking tray with tinfoil. After both sides have been seared place the patties on the baking tray. When all patties are brown put the burgers in the oven and cook for about 10 minutes or until a meat thermometer reads 150 F. When it's 150 remove from the oven and top all the burgers with cheese. Return to the oven for 2 minutes. Remove from the oven and place the burgers on a large plate. Tent them with tinfoil for 5 minutes before serving so the juice stay contained. Enjoy! Ok, this is absolutely beautiful and delicious. If you're in the mood to wow your guests...and yourself- definitely make these! It's such a heavenly little parcel- soft fresh pasta, sweet sauteed leeks, a rich yolk center topped with chevre, truffle oil and chives! It's proper. It may require a trial run as dealing with egg yolks is very tricky! Make sure you have purchased fresh pasta, don't buy the fresh pasta that's been packaged and sitting in the fridge. Either go to a shop where it's made everyday or make it yourself- it won't work if the pasta is stiff! Saute Leeks in butter and olive oil. Let it cook down on med-low heat until soft and completely wilted (about 10-15 minutes). Add salt and pepper to taste. in the middle of one sheet place a teaspoonful of sauteed leeks and try to make a well in the center where you will place your yolk. Place yolk in the center of the chive well and GENTLY place the other sheet of pasta on top starting from the upper corners to the bottom. Get a large Ravioli press or place a large wide-mouthed jar around the egg and cut it's shape out. Press down the edges with a fork. Immediately top with another bit of sauteed leeks a generous coin of chevre, truffle oil and two chive cut on a bias. Delicious on this level rarely gets easier! This is such a simple, rustic amazing side that will please anyone! I love it with fish, poultry, meat or simply on its own! The tender yet crisp potato and baked parm topping is insane..you must try it! Preheat oven to 400. Cut potatoes in 1/2 inch slices and add to a pot of salted water. When all are cut, bring the water to a boil. Once the potatoes are soft enough to put a knife through yet firm (You don't want the potatoes to be soft enough to mash, they should still be in one piece), drain and toss with olive oil. We completed one baking module in culinary school so yes, in a way I have training in pastry arts but I'm a bit challenged. I'm imprecise, careless, mindless and don't pay attention to details. This is why I LOVE cooking- it's so completely forgiving. However, one attribute I didn't list above is proud. I take pride in what I do and refuse to entertain guests if I haven't made everything from beginning to end. Everything doesn't have to be from scratch but I want to be responsible for major components. Today my husband and I had our good friends Imran and Irmak over to celebrate their engagement...Yaaaay! And what better way to celebrate than with a delicious, moist absolutely decadent chocolate cake?!?!?!? This cake is so superb and pretty straightforward. It's a David Lebovitz recipe- he is awesome! 1. Adjust the oven rack to the center of the oven and preheat the oven to 350 degrees. 2. 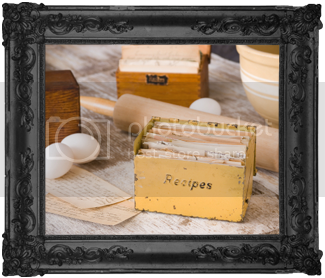 Butter two 9″ x 2″ cake pans and line the bottoms with circles of parchment paper. 3. To make the cake layers, sift together the cocoa powder, cake flour, salt, baking soda, and baking powder in a bowl. 5. Mix together the coffee and milk. Stir half of the dry ingredients into the butter mixture, the add the coffee and milk. Finally stir in the other half of the dry ingredients. 6. Divide the batter into the two prepared cake pans and bake for 25 minutes, or until a toothpick inserted into the center comes out clean. Cool completely before frosting. 7. To make the frosting, melt the chopped chocolate with the water (or cream) in a heatproof bowl set over a pan of barely simmering water, stirring occasionally until melted. Remove the bowl from the pan of water. 8. Cut the butter into small pieces and whisk them into the chocolate until completely melted and the ganache is smooth. Cool until spreadable, which may take about 1 hour at room temperature. Run a knife around the inside of each of the cakes which will help release them from the pans. Tilt one cake out of the pan, remove the parchment paper from the bottom and invert it back onto a cake plate. Spread a good-sized layer of icing over the top. Top with the second cake layer and spread the top and sides with the remaining icing as decoratively as you want. Storage: Cake is best the day it is made, although it’s fine the next day. Store at room temperature under a cake dome. Just be sure to keep cake out of the sunin the meantime. Eggplant is my favourite vegetable. I love that it can be fried, sauteed, pickled, baked, mashed, pureed and breaded! It can taste really rich or really light, great with bread, rice and pasta. I don't know another vegetable that's as dynamic... I lololololooooooove eggplant! This pasta is super delicious, light and easy to make. It's so nice to make fresh sauce with juicy fat tomatoes and what better way to have it than with deliciously pan fried eggplant?!?!!? 1/2 package rigatoni or the whole thing! Cut the eggplant in bite sized cubes. Sprinkle with salt and let sit for 30 minutes- this will make the eggplant sweat and lose some of its bitterness. Heat a saute pan with enough oil to shallow fry the eggplant. Pat the eggplant dry and fry in batches so they don't overlap. Turn the eggplant on all sides so every exposed area gets golden. Remove with a slotted spoon and rest on a plate lined with towel paper. Immediately sprinkle some kosher salt and pepper on the eggplant while hot! Reserve. In the meantime, bring a large pot of salted boiling water to a boil. Cook the rigatoni to your liking. In a saucepan, heat extra virgin olive oil and add the garlic. Cook on medium low heat until it's nice and golden. Once the garlic is lightly gold and soft add the tomatoes. They will start to sweat and collapse, add some pressure with your spoon to help break it down some more. Add 3 tablespoons of pasta water. Cover and let cook on low heat for 5-10 minutes (it depends on how long it takes to break down your tomatoes and make a sauce..some are softer than others...when it looks right it to your eye it's done). Add the chili flakes, 1/2 teaspoon of salt and some fresh cracked black pepper and basil. If the sauce is too runny you can add a teaspoon of tomato paste. Add the eggplant and cook on low for another 5 minutes. Drain the pasta and toss in with the sauce. Cook on low heat for one minute so everything mingles. Top with freshly grated parm cheese! I really enjoy and appreciate a good salad but it seems that most restaurants have such predictable salad items. There's the caprese, the arugula and parm, nicoise, blue cheese and pear etc. So when I went to abc kitchen I was really surprised and delighted with their sweet pea and parmesan salad. This is such a great salad to serve in the summer because it's filling yet very light! Bring a large pot of salted water to a rolling boil. Put in the sweet peas for one minute. Remove and drain. Julienne all the sweet peas. Shell a couple of the sweet peas and reserve the individual peas for garnishing, then carry on julienning it. I volunteered at an event and was blown away by some of the catering techniques. There were trays of beautifully blanched asparagus, sitting in crystal flutes with the most delicious dollop of hollondaise in the bottom. The idea was for people to socialise whilst holding their flutes, dipping, biting, sipping wine- looking fabulous against the backdrop of Manhattan's skyline....well I don't know if this was the idea per se but it certainly seemed so. I'm a bit less fancy. I still like the good stuff but with a rustic twist. Eager to recreate the asparagus and dipping sauce idea I decided to scratch the fussy hollandaise and delicate crystal flutes and replace them with a super simple vinaigrette and jam jars. This resulted in something equally pretty but with an edge. If you're throwing a garden party or having a casual get together and are in need of some finger food ideas, this is a great dish that can be prepared hours in advance! Whisk lemon juice, dijon, olive oil, canola oil, sugar and salt together. Reserve. Blanch asparagus in salted boiling water (cook for 1-2 minutes, drain and place in an ice bath). Remove, pat dry. 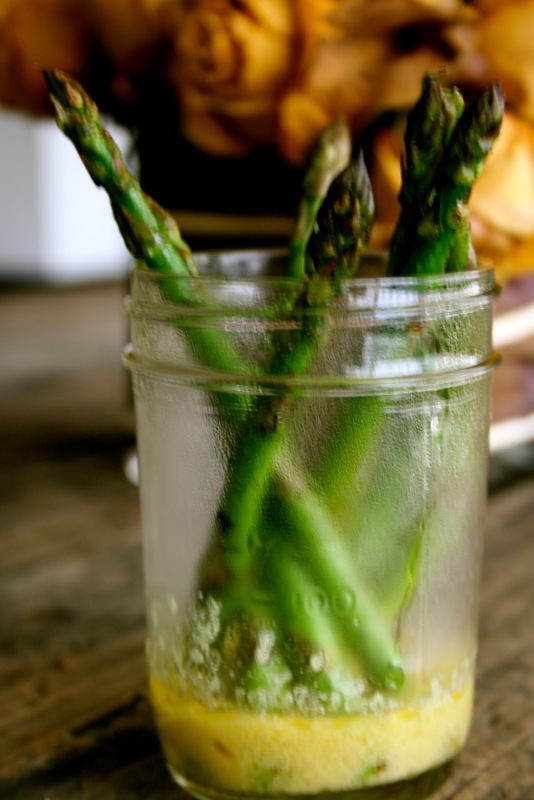 Place a tablespoon of vinaigrette in a jam jar or any long flute and as much asparagus as you think looks pretty. Enjoy! My husband's love of butternut squash soup results in me making it quite regularly. It's really straightforward and easy to prepare, so I like to experiment with its usual ingredients to add depth of flavour. I used some Indian spices and ginger to give it an extra kick and baked the squash first to allow its natural sugars to come through. The combination of the extra sweet squash when contrasted with the heat of ginger makes this traditional soup so much more delicious! Preheat oven to 400. Line a baking tray with tinfoil. toss the butternut squash with 1 tablespoon olive oil, salt and pepper. Place in the oven and bake until tender. You don't want to much colour as a charred squash will taste bitter when pureed. Once it's cooked just keep it on the side for later. In a large saucepan heat 1 tablespoon extra virgin olive oil and add onions. Sweat on low until soft and transparent. Add the ginger and cook for a minute or so. Add the lentils and one cup of water. Bring to a boil and simmer on low until most of the liquid has reduced. Add 4 cups of chicken stock and simmer for 30 minutes. Add tumeric, coriander, cumin and a good pinch of salt. Add the roasted butternut squash and and cook for another 15 minutes. Transfer the contents to a large bowl as you will return the pureed soup to the pot. Blend the contents in batches, returning each batch to the pot. Simmer on low heat until it's warmed through. Taste it- is it salty, not salty enough, too thin too thick? If it's salty add a pinch of sugar or a touch of cream. If it's bland add a pinch of salt. If it's too thin add some cream or carry on simmering and it will thicken. If it's too thick add some stock. I didn't add a touch of cream as the pureed lentils and squash really give a rich and creamy texture. Once it's perfectly set to your liking serve with some fresh cracked black pepper! I went to the grocery store and was bombarded with Asparagus. Asparagus was everywhere- I couldn't escape it. I bought an entire bushel and ate it all... When dressed in a light vinaigrette and topped with a farm fresh poached egg, you literally can't stop till it's all done! The bottom stalk of the asparagus is tough and inedible so you want to break it off. It will naturally snap off when you apply some pressure to the bottom. Rinse the asparagus and add about 1/2 a teaspoon of extra virgin olive oil while it's still wet. Put on a hot grill or stove top grill. Cook for about 5 minutes, making sure you turn it over half way through. In a bowl, whisk salt, 2 tablespoons lemon juice, Dijon mustard and extra virgin olive oil. Remove the asparagus when it's cooked and drizzle the vinaigrette over it. Plate the asparagus as you like. Bring water to a boil in a wide-mouthed sauce pan. Crack the egg open above an espresso or tea cup (something small that will help keep the egg contained). Add 1 tablespoon lemon juice to the water (some people use vinegar but you're entire house will smell of it!) Whisk the water in one direction to create a whirlpool effect. Gently add the egg from the cup- the swirling motion will help the whites envelope the yoke. After two minutes remove the egg with a slotted spoon, gently pat dry with towel paper and serve with the asparagus!